The battery indicator in the MacBook’s menu bar provides little information and there are better alternatives. Here are some interesting apps that show vital information about the battery in your laptop. If you have an Apple MacBook and use it away from mains power, you will no doubt check the battery level fairly often. It depends on what apps you are running, but sometimes apps put a big load on the battery and it can run down in a few hours. 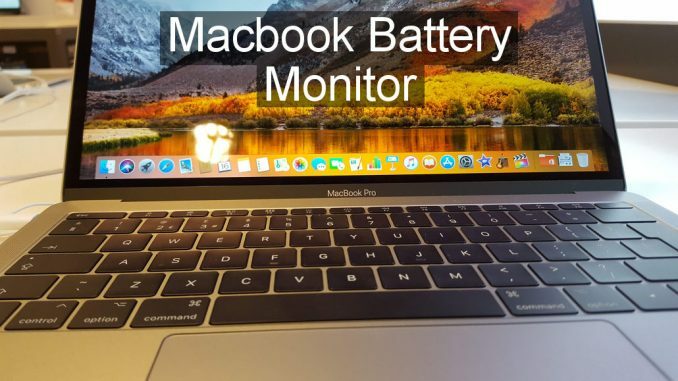 Battery life depends on several factors such as the capacity, how hard applications are running the MacBook’s hardware, and the age and condition of the battery. Play a fast action game and the battery level will fall faster than when word processing for example. An old MacBook with a well-used battery will not run for as long as it used to when it was new and as the charge cycles increases, the capacity to store charge decreases. Here are several apps that can be used to replace the macOS menu bar battery indicator and they provide much more information, which makes them more useful than the built in indicator. To hide the macOS battery indicator go to System Preferences > Energy and clear the checkbox Show battery status in menu bar. These utilities can be found in the Mac App Store. Just search for the name. TLOB is as simple a battery status monitor as you could get. Some time ago, Apple removed the option to display the time remaining on the battery in the menu bar, so this utility adds it. There is little to say about it and it does nothing but display the time. It does what it says and I am sure many people will find it useful. 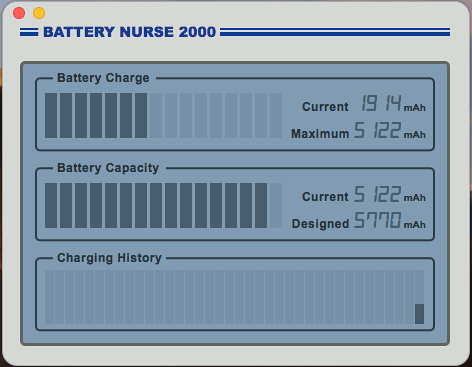 Battery nurse is another very simple app, but it shows some useful information. The Battery Charge shows the current battery level and it is displayed as a bar. You can also can see the current in mAh and the maximum. The Battery Capacity shows the health by showing the current capacity and designed capacity in mAh. The bar is easy to read and you can see whether the battery is becoming weak. The charging history is also shown. This is a desktop app and I would prefer it to be a menu bar tool. It would be nice for this to be available as a menu bar icon. It is free and is OK, but coconutBattery is better. Battery Guru is another free app in the Mac App Store (search for it) and when this is installed and run it puts a number in the menu bar. What’s this? This is a different kind of battery status indicator and it shows the amount of current being drawn from the battery at any one time. The bigger the number, which measures milliamps, the more power is being drained from the battery. High numbers mean that the MacBook will not last as long before it needs recharging. In a way it is quite useful to see how the current usage varies as you run apps. You could let the Mac idle and see what the base figure is, and then open some apps and see the current usage rise. However, I would prefer to see the time remaining because it is hard to know what 1074, as in the screenshot, means. The information displayed when the menu icon is clicked is more useful than Apple’s battery indicator, but in a plain and simple way. No graphics or icons here, just text. However, everything you need to know is here, like the time remaining, current capacity, original capacity, percentage of original capacity, percentage charged, number of charge cycles, manufacture date, temperature and so on. Battery Field is a menu bar utility that displays useful information about the battery. However, I would prefer a plain menu rather than the graphic image that is displayed. If the look of the app does not bother you, it is quite useful. The menu bar shows a small icon that indicates charging or discharging and the percentage charge. It is more compact than the Apple battery indicator, so it reduces the menu bar clutter. Click the icon and a window opens to show the time remaining on the battery. It also shows the rate of discharge and there are four indicators – Stop, Slow, Normal and Racing. Mine was Racing because a Time Machine backup was taking place. It is useful to know when the Mac is using a lot of power so you can investigate why. An alternative display is available and it shows the battery temperature, cycle counts and charge capacity. It also shows the time until charging is complete. I am not a fan of the interface, but the information displayed is useful. 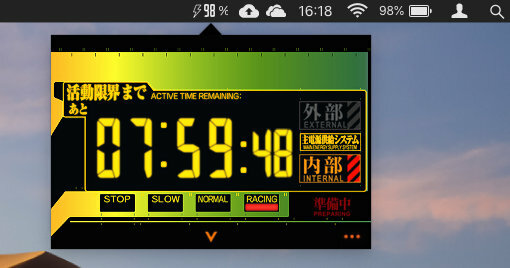 This battery status indicator is one of my favourites because it is simple, yet provides all the information you need. 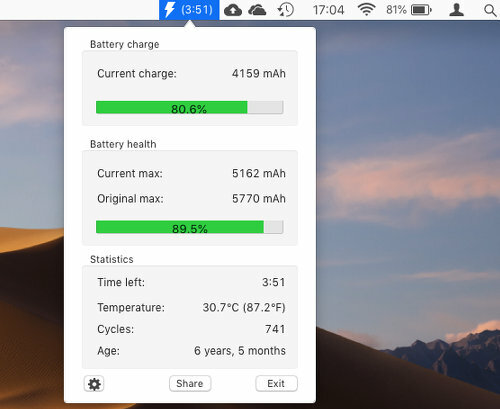 A battery icon is added to the menu bar and this has has five designs that show charging or discharging, discharging fast, fully charged and low battery. This icon is immediately followed by the time remaining on the battery. The time varies depending on how fast apps are draining the battery, which is perfectly normal of course. Run an app that works the Mac hard and the time remaining falls, but close all apps and the time remaining increases, which is good to know. The battery percentage is optional and it can be shown in the menu bar or hidden as you prefer. 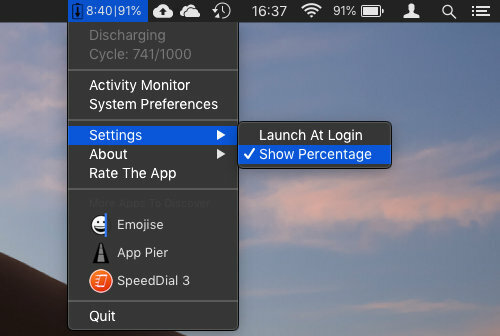 Click the icon and a menu shows the cycle count and provides access to Activity Monitor, which is a useful shortcut, and System Preferences – not needed because it is on the Apple menu. Those apps in the menu are links to other apps by the author. This battery app nearly didn’t get included in this roundup because it looks like it was last updated in 2012. It is six years old and, in places, it shows. However, it turned out to be a very useful app and one of my favourites. An icon is added to the menu bar and there is an option to show the time remaining on battery power.Plug the charger in and it shows the time remaining to fully charge. 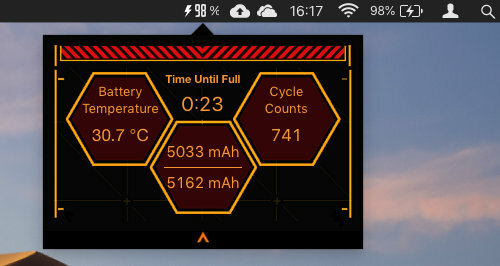 Click the icon and a panel with lots of useful information is displayed, like the current charge, current maximum and original maximum so you can see how healthy the battery is, the time left, temperature, cycles and more. Despite its age, this is a very useful app. However, it does not work so well with the macOS Mojave dark theme. Both the icon and time remaining are displayed in black and black on a black menu bar is hard to see! You can, in fact, see it when the icon is clicked because it is highlighted. The information panel is the same whether the light or dark macOS theme is selected. Which battery status indicator is best? 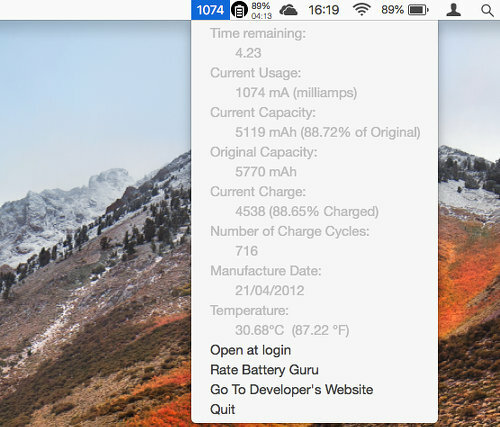 Simple Battery Monitor is a great app and is worth adding to your MacBook if you want an alternative to the macOS battery indicator. Battery Guard is also good if you prefer the Mac’s usual light theme. Battery Guru is also worth considering, but the menu display is not quite so easy to read.